... will catch the buyer's eye. Is Your Business Looking Good On-line? Only great quality images can portray great quality surroundings. needs presenting in a special way. Full bespoke service for business owners on a fee per image basis. Have a property abroad that you rent out? Talk to me about a contra-deal. I could do with a holiday! If you are selling your home you will want to get the highest price possible but how is this possible when every other house for sale is listed on the same websites? The only real way to do this is to make a great first impression on your potential buyers. This is something that you won’t get a second chance at, so you will have to do it right the first time! The main advantage of making a splash with high-quality imagery of your property is that your potential buyers will assume that their competitors will be making inquiries first light. Fear of loss is a massive lever in sales and is far more effective at getting deals done than say, desire for gain. I have seen houses go for more than asking price but only when there are multiple offers on the table and you have two or more buyers that don’t want to lose out. The alternative to the above scenario is to let your agent take the photos and make no splash at all. This is when your problems really start because the longer your house sits on the market, the lower it’s perceived value will be. The fear of loss is lost. You may sell eventually but you will be unlikely to get the full asking price. Estate agents understand the value of using a professional property photographer but the additional costs involved doesn’t help them to be competitive in a highly competitive industry. In many cases, the agent’s fee has been so far squeezed that there simply is no way forward. However, I do believe that if you insist on this as a condition of your business then you will probably find an agent who will. Other than this you may have to find the expense yourself but if that is the case you can be sure that the small investment needed to do this right will give you a great ROI. 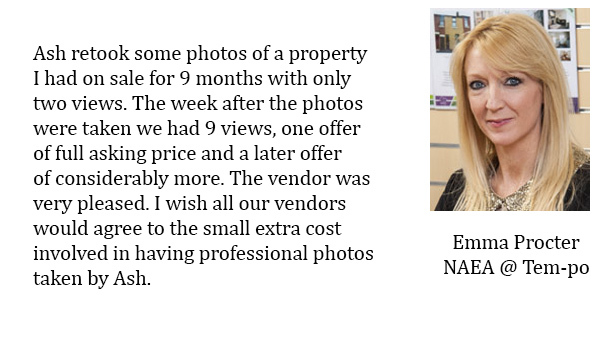 See one of my Estate Agent testimonials below.